STABILISATION AND ASSOCIATION AGREEMENT BETWEEN MACEDONIA AND EU SIGNED. Stabilisation and Association Agreement between the Republic of Macedonia and the European Union has been signed Monday afternoon in the European conference centre in Luxembourg. Prime Minister Ljubcho Georgievski in behalf of the Republic of Macedonia and Anna Lindt, Swedish Foreign Minister, whose country is the current chair of EU, have signed the stabilisation and association agreement. Temporary agreement for trade and trade issues between the Republic of Macedonia and EU has been also signed. The signing of the Agreement is within the Stabilization and Association Process, whose main goals are the development of regional relations based on agreements, development of lasting economic and trade relations in the region and with the region, development of the new finance instrument CARDS-program, and respect for the main European principles for democratization, civil society, education and institutional upgrading, enhancing the cooperation in new areas including the justice and the internal affairs (such as the asylum, migrations), as well as the intensifying of the political dialogue. The Association and Stabilization Agreement is an associative agreement within the wide pre-accession strategy, which aims to prepare the candidate countries for EU integration. The strategy refers to the transition of the country, legislative coordination of the domestic market and multi level structural dialogue. As a preferential agreement, it should contribute towards economic and political stability in the country and in the region as well as to establish association between Macedonia and the European Union. The Association and Stabilization Agreement is consisted of preamble, ten chapters, seven annexes, five protocols and joint unilateral statements. The preamble refers to the joint intentions of the two parties - signers of the agreement and to its goals. The goals of the Agreement are the following: approaching to full integration of the structures into EU, support of the consolidation of the democracy, law on rule, economic development, reforms, administrative structure and regional cooperation, establishment of formal framework for political dialogue on bilateral and regional level, promoting the economic relations, the trade, the investments, the policy of the companies, the transport and customs cooperation, increased political and economic freedoms, establishment of legal state and observing of the human rights and the rights of the minorities and the principles of free market economy. The agreement expresses EU's readiness to contribute towards the economic reforms in Macedonia, to establish political dialogue on bilateral and multilateral issues of shared interest including the regional aspects and to adjust the Macedonian legislation according to the principles of the European Union. The preamble also includes an "evolution clause", by which the EU expresses readiness to integrate Macedonia to the highest extend in the political and economic currents in Europe, which makes Macedonia potential candidate for gaining an EU membership. The second chapter "Political Dialogue" confirms Macedonian determinacy to intensify the political dialogue, especially on the international issues, the reginal cooperation and good neighboring relations as well as on the joint views for the European security and stability. The dialogue will be led on a level of ministers in the framework of the Council and on a parliamentary level within the Parliamentary Committee will be regulated in the second stage. The third chapter "Regional Cooperation" regards the regional cooperation based on Macedonia's commitments for promotion of good neighborly relations. Signing of a Convention for regional cooperation is also planed, which will include political dialogue, establishment of free trade zone, joint concessions for movement of labor force, establishment of enterprises, provision of services, free movement of capital and cooperation in other areas of joint interest. The Convention is to be signed latest two years after the implementation of the Association and Stabilization Agreement. Cooperation with the countries that already have agreements for association with the EU is also planed. "The free movement of goods" regulated in the fourth chapter, and it provides free export of Macedonian goods to the EU markets, with exemption of the wine and beef meat. According to this provision, Macedonia will gradually open its market to the EU and in a period of 10 years a free trade zone between Macedonia and EU will be established. The product and the other trade related issues would be regulated through annexes and protocols on industry and agricultural products, fish, textile and steel. Regarding the wine and the alcohol drinks there is a quantitative limit of 1,650 tones. The fourth chapter will become operational on June 1, 2000. The fifth chapter also regulates the "Movement of labor force, founding of enterprises, services, and capital" is based on the internationally recognized regulations of movement of labor force, founding of enterprises, provision of services, the ongoing payments and the movement of capital. The chapter six "Complying the legislation and implementation of the Laws" refers to the coordination of Macedonia's legislation with the one of the EU. The obligation for coordination of these documents comes on power starting from the day of signing of the Agreement, and according to the article 68 of the Agreement it would be undertaken in two phases. In the first phase, the legislation in the field of competition, public supply, standardization and accreditation, industrial and intellectual property and the data protection. Chapter seven "Justice and internal affairs" are for the first time included in the Agreement with EU and are based on the Amsterdam agreement from 1999. The chapter regards the cooperation in the field of strengthening of the institutions and ruling of the law, then the visa regime, border control, exile, migration, prevention and control of illegal immigration, struggle against money laundering and against crime, as well as against other illegal activities. The chapter eight "Cooperation Policies" regulates the economic, statistic, industrial, cultural and social cooperation, as well as the cooperation regarding the banking sector and financial services, promotion and protection of investments, small and medium sized enterprises, tourism, customs, tax collection, education, information, communications, transport, energy, regional and local development, research and technological development and environmental protection. The goal of this chapter is to provide institutional connection and transfer of EU policy in Macedonia and development of compatibility of all systems. The chapter nine "Financial Cooperation" includes the provisions regarding the financial cooperation and lists the sorts and conditions for this sort of cooperation. The financial cooperation would be realized through granting of non-refundable funds, loans, including the loans from the European Investment Bank, macroeconomic assistance and direct support to the budget. The means are aimed for the harmonization of the legislation and the cooperation policies. Chapter ten "Institutional, common and closing provisions" regulates the establishment of institutions for monitoring of the Agreement implementation, such as Association and Stabilization Council, which is consisted of the members of EU Council, EU Commission and the Macedonian Government; Committee for Association and Stabilization, whose obligations are determined by the Association and Stabilization Council and Parliamentary Committee for Association and Stabilization, as a joint forum where the Macedonian and Euro parliamentarians will exchange their opinions on topics of same interest. The Association and Stabilization Agreement is signed for unlimited period of time and every part that signed the Agreement can refuse it by informing the other part. The Agreement ends six months, after such an information. Depositor of the Association and Stabilization Agreement is Secretary General of the European Council. After the signing the Association and Stabilization Agreement should be ratified by both parts that signed the agreement in compliance with their own procedures. The Agreement enters into force on the first day of the second month after the date, when the ratifying procedure is over. When the Association and Stabilization Agreement enters into force it would replace the Cooperation Agreement signed between Macedonia and the European Union April 29, 1997. CITIZENS OF MACEDONIA GIVE UNANIMOUS SUPPORT TO SAA PROVISIONS. I hope that Macedonia will be able to present the first results of the political dialogue at the European Union Summit in Stockholm in June, Macedonian Prime Minister Ljubcho Georgievski said Monday at a press conference in Luxembourg regarding the signing of the Stabilization and Association Agreement between Macedonia and the EU. "Macedonia was considered as an example for good interethnic relations in the region until the recent developments that took us all by surprise," Georgievski said, addin that "Macedonia sees the political dialogue as the only way for resolving of the problems." In that respect, the Macedonian Government offered an intensified dialogue, which was accepted by the EU within the framework of the SAA, Georgievski said. Asked about the SAA significance for the Albanians in Macedonia, leader of the Democratic Party of Albanians (DPA) Arben Xhaferi said that primarily it presented the country's orientation to Europe, which is important for Albanians in Macedonia and Europe. Swedish Foreign Minister Anna Lindh expressed her regret, as representatives of the Party for Democratic Prosperity did not attend the signing ceremony, considering it as a wrong move of this party. But, she hoped that PDP would take part in the SAA implementation. According to the leaders of Macedonian political parties, signing of SAA presented the unanimous support of Macedonian citizens to the Agreement provisions. The Interim Trade Agreement, which was also signed today, provides for free trade between Macedonia and the EU within 10 years. Over the past year the EU has made several trade concessions to Macedonia. The interim trade treaty is to take effect from June 1. GEORGIEVSKI: THIS IS HISTORIC EVENT WITHOUT PRECEDENT FOR MACEDONIA. "On the behalf of all leaders of the political parties and on the behalf of all Macedonian citizens I would like to thank you for this great event and this great opportunity. I hear with pleasure that this is an important event for the European Union as well, but I assure that this is really historic event without precedent for Macedonia," Macedonian Prime Minister Ljubcho Georgievski stated prior to the signing of the Association and Stabilization Agreement between Macedonia and the European Union in Luxembourg. "The presence of the leaders of all political parties and the leaders of all nationalities in the Republic of Macedonia says that whole Macedonia is behind this Agreement and behind the European policy. This agreement is recognition of all our efforts in the past ten years of our independence as a country in the field of democracy, the multi ethnic co-life, the reforms, and the regional and international cooperation. This agreement also obliges us to give much more in all this field in the future," Prime Minister Georgievski stated. "We consider the Association and Stabilization Agreement as an opportunity and commitment for the implementation in these spheres, more democracy, more efforts on the multiethnic plan, and more reforms. In all these spheres we emphasize the intensifying of the dialogue in order to gain more harmonized multiethnic community in Macedonia," Georgievski said. Macedonian Prime Minister especially stressed the signing of the temporary agreement on trade and trade related matters between Macedonia and EU, which contributes "Macedonia to become part of the European markets." "The fact that we became accession member of the European Union, is a big challenge, that we will justify very soon with very serious results," Georgievski stated. At the end of his address, Macedonian Premier thanked once again for "the joy and the pride that you gave to our country." "I believe that whole Macedonia is with us at this moment," Macedonian Prime Minister Ljubcho Georgievski stated prior to the signing of the Association and Stabilization Agreement. LINDH, SOLANA AND PATTEN ADDRESSES PRIOR TO THE SIGNING OF AGREEMENT. "This is very important moment for Macedonia and for the European Union. With the signing of the agreement, Macedonia would be the first country in the region with most advanced relations with EU and would represent a model for the other countries in the region. This is a significant step toward the further integration of Macedonia into EU, it is a social instrument for consolidation of the stability and security and significant action plan on the security, economic and political reforms in Macedonia, which would lead toward establishing of true democratic society," Swedish Foreign Minister Ana Lindh stated prior to the signing of the Stabilization and Association Agreement between Macedonia and EU. "According to the agreement Macedonia would have the opportunity to trade with EU under appropriate conditions, to open its market toward the Union, to establish institutions, to harmonize the legislative, to strengthen the efforts regarding the migration and the asylum as well to fight successfully against the trafficking," Lindh stressed. "You should also consolidate your efforts for democratic society and for the rule on law, to respect the rights of the national minorities, which would lead toward the establishment of the multi ethnic society. We know that you approach very seriously to this task, which would enable the European Committee to have a central role in the governing of such a policy. With the agreement we give you the true support and we would like to congratulate you on this," Swedish Foreign Minister stated. "Today's agreement opens a new door of opportunities, opens opportunities for new cooperation with Europe and within Europe, although the hard work is yet to come. We are here to support you in your efforts, but the future is in your hands and in the hands of all Macedonian citizens. Welcome to our extended family," Lindh stated. EU High Representative for Common Foreign and Security Policy Javier Solana stated the following in his address to the Macedonian representatives: "You have very important responsibility before you. In the last period you have cooperated with us and I am sure that you will succeed on the behalf of the Macedonian citizens. Macedonian citizens ought to know that you have future close to Europe and that future deserves to fight for it and deserves all your efforts in order to be part of this family. The leaders should lead, but you have the responsibility, as you devoted yourselves to the task, your country to be politically and economic integrated in EU. You know that you will be always welcomed in the European family and you will supported whenever it is necessary." At the end of his address, Solana wished luck to Premier Georgievski and to the citizens of the Republic of Macedonia. "I would like to support the act on this historic day for Macedonia, but also historic for the European Union, as this is the first Stabilization and Association Agreement that we sign," Euro Commissioner of External relations Christopher Patten stated in his address. "That is done for the good of the Macedonian citizens as well as for the political and economic choice of the country. This is also a moral choice, which means that EU is determinant to support you. That also means that you would continue to deal the matters you face. We will support you to resolve them as we have supported you in the past few weeks, but the challenges are ahead of you. We believe that you will handle the challenges and the problems, as you have succeeded to take part in this extended European family," Patten pointed out. CONCLUSIONS FROM EU MINISTERIAL COUNCIL ON SAA. On the occasion of the signing of the Stabilization and Association Agreement between Macedonia and the European Union, the Council of the foreign ministers confirmed the support for the Macedonian Government and the Macedonian territorial integrity within its internationally recognized borders. They also acknowledged the Macedonian Government for the restrain use of force in preventing the extremists' violence, it is stated in the conclusions of the Ministerial Council. Within the Stabilization and Association Process, the Council welcomed the decision of the Macedonian Government to establish all-parties European Committee, which will positively influence the undertaking of the reforms and the development of the dialogue, guarantying that all ethnic communities will take part in the political and economic development of the country. The EU Council of Foreign Ministers welcomes the presence of the Macedonian political forces and their commitment to accomplish the goal. The Council expressed its satisfaction on the commitment the first results of the announced dialogue to be presented by June 2001. The Ministerial Council especially recognized High Representative for Common Foreign and Security Policy, for his contribution toward the establishing of the Committee. The Council requested from Solana to follow closely the discussions of all parties in the European Committee cooperating with Macedonian President Boris Trajkovski and the Committee. The foreign ministers of the EU member countries appeal to the Macedonian Government and democratically chosen political representatives to work together to build true multi ethnic society in the Republic of Macedonia. EU reaffirmed the determinacy to support practically and financially the Macedonian Government, in order to coordinate its activities with the international community, the conclusions of the Ministerial Council read. Solana stated that he is "encouraged by the recent reduction of the tensions between the Macedonian Government and the Albanian extremists. There is an increased sense of stability, and the security is significantly improved." Solana thinks that the aspirations of the Albanians in Macedonia should be considered such as: their increased participation in the public institutions, the construction of the SEE University in Tetovo, the adoption and implementation of the changes of the Law on self-government, and the broadcasting of the third TV channel with program for the Albanian minority. Macedonian Foreign Minister Srgjan Kerim assessed that EU achieved big success, adding that Solana and Euro Commissioner for External Relations Chris Patten proved to be efficient team in Macedonia. POLITICAL DIALOGUE WITH EUROPEAN TROIKA: AN IMPORTANT DAY FOR MACEDONIA AND EU. The political and security situation in the Republic of Macedonia has been the main topic at Monday's political dialogue between the Macedonian delegation led by Prime Minister Ljubcho Georgievski and the European Troika. Macedonian delegation consisted of Vice-Presidents of the Government Bedredin Ibraimi and Zoran Krstevski, Foreign Minister Srgjan Kerim and Macedonian Ambassador Jovan Tegovski. Anna Lindt, Swedish Foreign Minister, whose country is current chair of EU, Javier Solana, EU High Representative for the Common Foreign and Security Policy, Christopher Patten, European Commissioner for External relations, and Louis Michel, Foreign Minister of Belgium, whose country will be the next chair of the EU, presented the European Troika. Macedonian Foreign Minister Srgjan Kerim stated that at the meeting it has been concluded that incidents in the Republic of Macedonia are surpassed and that the security situation is calming. 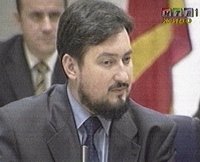 During the political dialogue, Prime Minister Ljubcho Georgievski said that the Republic of Macedonia maintains the position not to negotiate with the terrorists, instead there will be political dialogue with all parliamentary parties, which are interested to be included in the negotiations in the framework of the initiative of the President of the Republic of Macedonia Boris Trajkovski. It has been stressed that one of the goals of this dialogue is finding of easier way for implementation of the Stabilisation and Association Agreement between the Republic of Macedonia and the European Union that is to be signed Monday in Luxembourg. It has been concluded that this is a great day for the Republic of Macedonia above all for signing of the Agreement and it is also an important day for the EU because "the golden bridge" is set up between Macedonia and EU. It has been agreed EU to be engaged with concrete assistance in the implementation of the provisions of the agreement and will also engage experts from the Union during the political dialogue within the frameworks of the initiative of the President Trajkovski. The plan for action of the Stabilisation and Association Agreement has been presented at today's political dialogue and concrete measures for its implementation have been discussed. Answering on journalists question regarding the absence of the Party for Democratic Prosperity, Minister Kerim said that non-attendance of this party is the decision of the party leadership and that the EU has not been satisfied with such decision, however it leaves to the party to decide whether to stay out of the political dialogue. "In this case the party will be self-isolated and not only that it would ignore the institutions in the Republic of Macedonia but it would also ignore EU, NATO, OSCE and the USA that support the efforts of the EU," Minister Kerim said. Regarding the presented non-paper by the Democratic Party of the Albanians, Foreign Minister said that the document would be discussed within the frameworks of the political dialogue between the political parties in the Republic of Macedonia. Asked about the absence of the leader of the Democratic Alternative Vasil Tupurkovski from today's signing of the agreement, Kerim said that Tupurkovski showed no interest to participate. Macedonian Foreign Minister Srgjan Kerim said that foreign ministers of EU member-states hold a meeting and that Macedonian delegation will hold meeting with the fifteen member-states of the ministerial council of the Union. Minister Kerim is due to hold separate meetings with foreign ministers of the EU member-states. Tetovo is at peace after last month's fighting. Macedonia has signed a stabilisation and association agreement with the European Union which officials hope will help avert more violence in the country. The signing, in Luxembourg, comes after two weeks of clashes between ethnic Albanian rebels and Macedonian security forces at the end of March. It puts Macedonia on the path towards eventual EU membership, ahead of all other Balkan states. EU officials want the agreement to stimulate talks designed to address the grievances of the minority ethnic Albanian community, but in a sign of continuing distrust, one Albanian party - the Party for Democratic Prosperity (PDP) - refused to join the delegation. In talks with EU foreign ministers, Macedonian leaders said the talks would achieve concrete results by June. Foreign Minister Srdjan Kerim said that the PDP's refusal to take part amounted to "self-isolation" and added that the delegation was nonetheless "very representative". The Macedonian Government includes members of another ethnic Albanian party, the Democratic Party of Albanians. Prime Minister Ljubco Georgievski hailed the agreement. "This agreement is recognition of all that we have achieved in the last 10 years in the fields of democracy, multi-ethnic cohabitation, reforms, regional and international co-operation," he said. "At the same time it is an obligation to achieve even more in all these fields in the future." Javier Solana, the EU's chief of foreign and security policy, called the signing "an important opportunity to achieve real progress in moving forward the process of enhanced dialogue". The BBC's Central Europe correspondent, Nick Thorpe, says that accelerating the country's approach to the EU could help the different national groups living in the country to forget their disagreements. But diplomats say that if Macedonia hands over a letter formally asking to join the EU, there would have to be a long review before negotiations could even begin. Albanians are believed to make up about one third of the population and are demanding the status of an equal nation, not simply a minority in the country alongside the far smaller communities of Turks, Vlachs and others. Mr Kerim said he did not exclude the possibility of political dialogue with Albanian leaders leading to constitutional change. "It depends on all political parties," he said. Three rounds of talks have already been held in Skopje under the chairmanship of President Boris Trajkovski in the search for a Macedonian-Albanian compromise. Macedonia's Roma Cast Their Lot With Skopje. SKOPJE, Apr 9, 2001 -- (Agence France Presse) The Roma of Macedonia, traumatized by the persecution of their brethren in neighboring Kosovo, have given their full loyalty to the government in Skopje in its struggle against ethnic Albanian rebels. "We are loyal to Macedonia and we have a duty to defend our country," said Mustafa Miljenje, a senior official of the National Union of the Roma in Macedonia (SRM), the main political force of the country's Roma population. The Roma oppose the "terrorists," Miljenje said in a reference to the recent clashes between the ethnic Albanian separatist guerrillas of the National Liberation army (NLA) and government forces. Estimated at about 60,000 people out of a total population of two million, the Roma community in Macedonia is mostly concentrated in a shanty district at the dead-end road from Skopje to the neighboring hills. But they also live in the areas around the predominantly Albanian western town Tetovo, the scene of violent clashes between the NLA rebels and the security forces in mid-March. There, members of the Roma community told AFP, "children and their parents sleep with their clothes on" so they can flee at any moment since "Albanians do not like Roma." In Sutka, a poor, dust-swept suburb, houses are made of used bricks and cartons and exhausted horses pull wooden carriages packed with poorly-dressed children through the streets. Women collect wood for heating or wash clothes at the taps by the main road, where 1970s-era Mercedes cars pass by decorated with garlands and plastic dolls on the back windshield. Near an old merry-go-round, painted in the red and yellow of the Macedonian flag, other children play ball on a make-shift field, with goals marked by stones. The Roma community owns two private television stations, SUTEL and BTR, and one daily newspaper, Roma Time, with a circulation of about 3,000. Among the issues often covered are sports and culture, and the election of Miss Roma in beauty contests held in January and July. But a fear of war still prevails despite an at least temporary halt to the fighting with rebels from the large ethnic Albanian minority. "I am afraid of war and terrorists, but I will never give up my Macedonia, I will never leave," Majda, a 33-year old mother of four, insisted. Nearby, a woman threatens to throw a shoe at a black cat, as if hoping to cast away bad luck. A smell of lilacs in bloom is mixed with strong smell of grilled coffee grounds, prepared from old traditional recipes -- on stoves dating back to another era. "We are the poorest community in Macedonia, some 80 percent of Roma live on welfare," Miljenje said. "A family of four gets about 40 dollars per month." 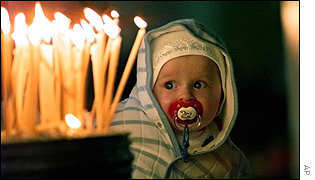 But this situation "is nothing compared to horrible fate which has hit the Roma in Kosovo," he said. Since NATO-led peacekeepers arrived in the now UN-run Serbian province Kosovo in June 1999, Roma and other non-Albanian minorities have come under a series of sometimes deadly attacks by extremists from the majority Albanian population. Accused by the Albanians of taking sides with the Serbs during the 1998-99 Kosovo war, Roma felt they had no other choice but to flee the province. Guns quiet but fear of war still haunts Skopje. The fear of war is still palpable in Skopje, a week after the government announced its "victory" over ethnic Albanian guerrillas. The two communities -- the majority Macedonian and the ethnic Albanian minority -- still eye each other warily across a deep divide. On March 31, Skopje officials insisted their security forces had neutralised the guerrillas of the self-proclaimed National Liberation Army (NLA) operating in the northern areas of the country, bordering the UN-administrated Kosovo province. Macedonia, which was waging its first military operation since gaining independence in 1991, has done its utmost to reassure the population, but also the international community, which has called on Skopje to restrain from exaggerated use of force. Security forces have made a number of arrests of "terrorists," as Skopje and several international officials refer to the NLA rebels. Meanwhile, de-mining operations in the combat zones continue. Even on Macedonian television news programmes, the main source of information for the mostly rural population, news of the conflict has dropped to the second slot. And government spokesman Antonio Milososki told AFP that the "situation has relatively normalised," insisting that the priority for Skopje would be an "intensive political dialogue". But in Skopje, the air of concern could still be felt in the National Library cafe, which both Albanians and Macedonians visit, but sit at different tables. "The most difficult thing to overcome is this psychosis of war. New conflicts will erupt again since the Albanian demands are not political ones, but aimed at annexing the northwest of Macedonia" to Kosovo, the UN-run Serbian province with a majority Albanian population, Filip, a 23-year-old Macedonian said. Several meters (yards) away, Fatmir, a 23-year old Albanian medicine student, insisted it was "calm which is disturbing". "Macedonia does everything in order to look like a state of law. The situation should not be idealized, we live among each other, but in two parallel worlds, and we are not recognised as a constitutive people," he said. Demands by the Macedonian Albanians -- 98 percent of them of Muslim religion -- who officially represent one-fourth of the population -- are mostly focused on the changes which would bring them a status of a constitutionally recognized people. However, this demand is categorically rejected by Skopje. President Boris Trajkosvki, himself a protestant, also dismisses the possibility of federalisation of the country, as demanded by the more radical Albanian factions. He has been engaged in the consultations with the political parties -- including the Albanian ones -- represented in the parliament, in order to overcome the crisis. In the Skopje districts populated mostly by the Albanians, the recent hostilities have stepped up the frustrations even more. In the Albanian-run cafe avoided by Macedonians according to its owner, patrons closely read the most popular Albanian-language newspaper published in Macedonia, Fakti. "Macedonia refuses to be a federal state," its front-page headline screamed on Saturday. The Macedonians "want to appear as winners. Trajkovski has taken upon the strategy of a man who wants to win a war. But this war has opened fresh wounds which can not be healed," said Ilic Ajdinic, an ethnic Albanian journalist.